We print, bind, and publish our own books, so we can make them available at very reasonable cost. The sections of a book are produced on our photocopier. 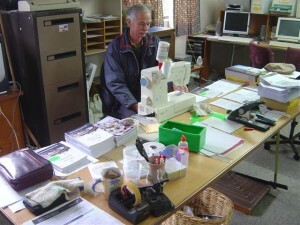 Then each section is sewn on this humble domestic sewing machine, glued by hand, pressed under the telephone books, and trimmed with a craft-knife. This is our first one written by Ronit Sogo (nee Meyer) and tells of her walk with the Lord through a valley of suffering. We all went through it with her, and together we learnt much of His wonderful grace. While she was a missionary on Rennell Island, the southern-most island in the Solomon group, she contracted Guillian Barre Syndrome. It is a condition of the immune system that attacks the outer sheath of the nerves and renders them useless. The whole body gradually shuts down. Ronit tells very honestly what it was like to be finally evacuated from Rennell, to Honiara, and then to Auckland, just in time. In the hospital the doctors had to connect her to a breathing machine to keep her alive while the medicine stopped the immune system from attacking, and as many people were praying around the world, her body slowly returned to normal. However there were many painful weeks as Ronit learned to walk and do normal functions again. In going through such a valley we learn the of the compassion of the Lord, and as Ronit tells in her book, this gave her authority to communicate this to others. E-mail us if you would like to read this book. The book includes a copy of a DVD of Ronit’s wedding on Rennell Island. She was married to Stephen Sogo on 27 January 2006 — a wonderful conclusion to an amazing “valley” experience with the Lord. If you are interested in the background to our fellowship and would like some encouragement to get involved in a similar one, then this possibly is a good book for you to read. It is written by a prophet so is pretty direct, and it starts at the author’s earliest days and how the Lord dealt with him in treating his calling seriously. Ron is honest about his weaknesses and his dependance on the Holy Spirit to keep his salvation in a place of daily fruitfulness. The story of how the Holy Spirit led him to marry his wife Jeanette will help some who long to be married, but know they can’t enter into the current fashion of dating. Ron then explains the early days of his family working with the Robson family to begin Drury Church, and how the Lord Jesus led the tiny fellowship to take more land in Drury, and allow others to be added. He explains how the gifts of the Holy Spirit have been essential in joining each member into a body — the body of Christ. On the back cover of this book, Ron and Jeanette have written — “In this small book we give some detail of how the Heavenly Father uses the shared life together to bring areas of our lives to the Cross. We testify how this then allows the Holy Spirit to work more easily in our lives, and so bring glory to our Lord Jesus. We also draw attention to the events that are taking place in the earth, and how they are fulfilling Bible prophecy. These prophecies say that pressure will come upon Israel and the Church to encourage them to be ready when our Lord Jesus returns. This book needs to be read prayerfully, so that its warning does not produce gloom, but rather an eager appropriation of the Holy Spirit that has been sent from the Father to equip His chilldren for everything that must take place on the earth before our Lord Jesus returns. We revise this book about twice a year, taking out songs we have not been using and entering new ones. But always keeping a song with the same number so that newer editions don’t conflict with older ones. E-mail us if you would like a copy. We can tell you the cost depending on where you live.